What's more satisfying that an obscure puzzle lock? How about one that involves chess pieces and a remotely actuated cash drawer that opens as if by magic? That's awesome, let's build it!! When the correct pair of pieces are placed on the designated board spaces, the Feather board hidden inside the chess board sends an unlock message to the receiving Feather inside the cash drawer case that is paired with a Motor FeatherWing to drive a linear actuator, thus opening the drawer to reveal more clues. Amazing! Here's the stream of John Park's Workshop LIVE if you'd like to see a more in depth tour of the build and operation. 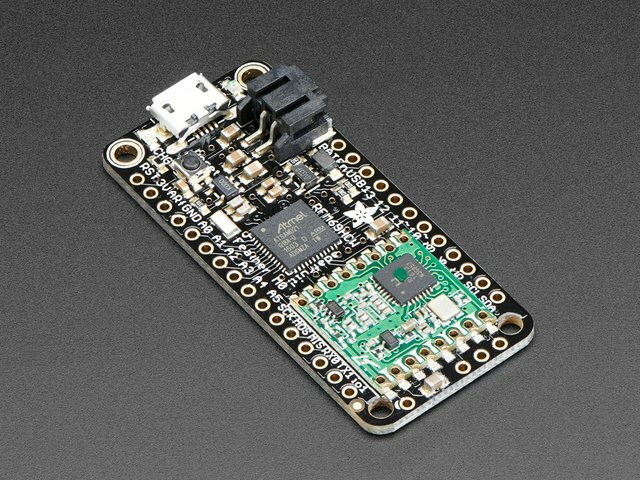 The reader circuit is made up of the RFM69 Feather M0, the NFC/RFID breakout board, a couple of 1.5K ohm resistors, battery power, and a Terminal Block Breakout FeatherWing for connections and its handy on/off switch. Below is an example of the circuit wiring as done on a breadboard for testing. Here's the same circuit and wiring transferred to the Terminal Block FeatherWing, before and after attaching the Feather. First, solder on the male header pins to the Feather as shown here. You can use the terminal breakout FeatherWing as a jig to keep things square. Next, you'll use the prototyping area of the FeatherWing to add the two resistors in-line with 3V power and the SCL (serial clock) & SDA (serial data) pins. Clip off the excess leads from the SCL and SDA ends of the resistors, but leave the other ends long for now so they can be connected to the 3V wires in a moment. Now, run some hookup wire from the free ends of the resistors to the 3V rail. Note how the 3V wires will connect to the resistors. Wrap the free resistor leads to the wire ends, then solder in place. Solder the UFL antenna connector to the underside of the Feather. It's helpful to pre-tin the pads, then rest the connector in place and reheat. Snap on the antenna adapter cable, and screw on the antenna to the other end. 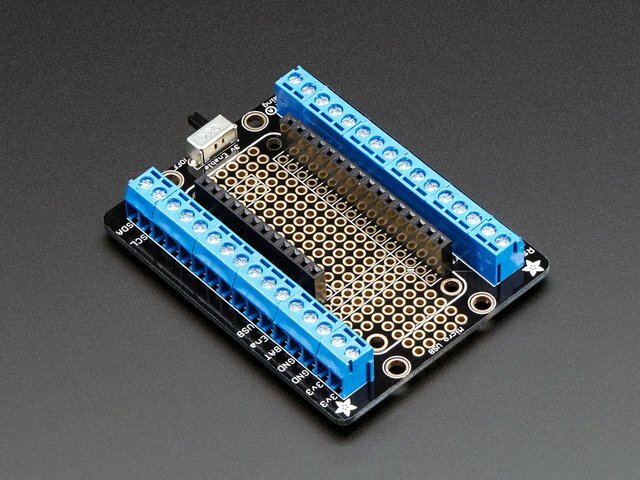 Now, you can solder wires to the PN532 board. The other ends of each wire will be screwed into the terminal breakout FeatherWing. Here a more in depth guide about setting up the board, however, we'll be using it in I2C mode, not SPI mode. Strip the wires on one end, then tin the wires. Insert them into the appropriate pin holes and solder. Once soldered, trim off any excess from the bottom side, so the board will lay as flat as possible on the underside of the chess board. Be sure to solder the mode jumpers on the PN532 breakout board as shown here to use I2C mode. Note the reference silkscreen on the board. You can now strip the other ends of the wires and screw them into the terminals as shown. Now, you're ready to code and test the reader! 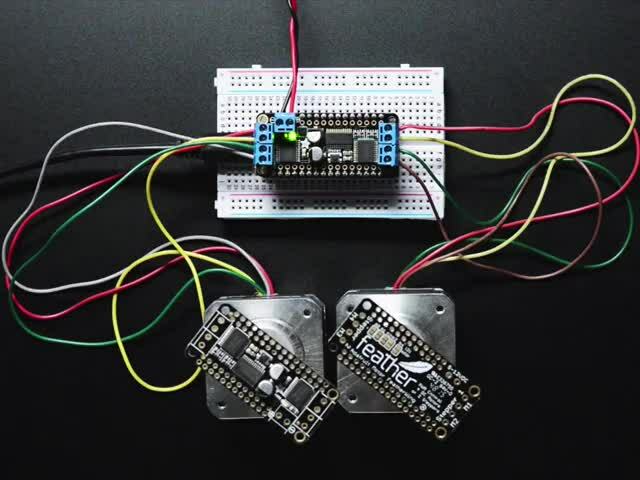 The actuator circuit consists of the RFM69 Feather M0 with antenna, the motor controller FeatherWing, the linear actuator, 12V 5A DC power supply for the motor, and LiPo battery or 5V DC power supply for the Feather. Here's what the circuit looks like before the FeatherWing is placed on top of the Feather. Note, the battery will be plugged into the battery extension cable ON/OFF switch, represented here by the in-line slide switch. This is the circuit after the FeatherWing has been placed on top of the Feather. Prep the Feather M0 by soldering on the female socket headers, as seen here. Assemble the Motor FeatherWing as shown here. 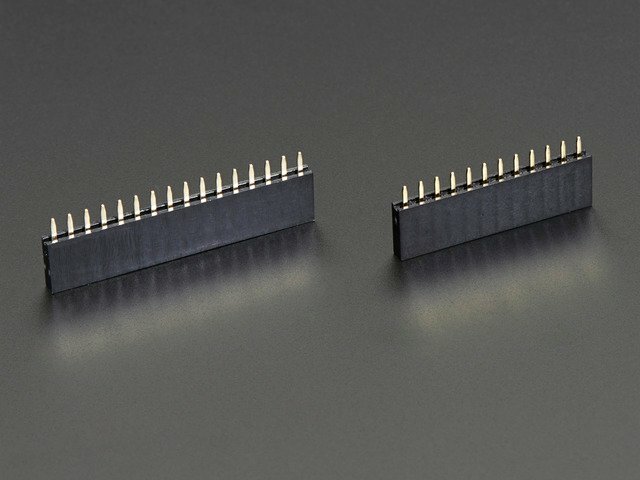 Get out your jeweler's loupe and solder on the antenna connector to the back of the Feather board! This link will show you how. Then, screw on the antenna to the cable, and connect it to the uFL jack. The Motor FeatherWing needs a separate 12V power supply to run the motor, vs. the small LiPo or 5V supply that will power the Feather. We'll clip the end off of the 12V supply (make sure it isn't plugged in first!) and screw it's wires into the FeatherWing power terminals. Clip the plug off, then carefully remove some outer insulation to expose the two wires within. One will be uninsulated, so twist it together. The other has insulation, remove a bit of that, then twist this end, too. This is very important! Use a multimeter to determine the polarity of the two wires. Plug in the supply, and set your voltmeter to DC. Touch the probes to the wires and watch for a positive voltage of around 12V. If this is negative, switch the probes and try again. Once you've determined which is positive (in the case shown here, the wire with the white insulation is positive) note this down. This will be the wire you screw into the + terminal on the Motor FeatherWing. I added some heat shrink tubing, color coded red for + and black for GND. Double check the polarity one last time, then insert the wires into the Motor FeatherWing's power terminals -- positive to positive, negative to negative -- and screw them down tightly. Next, you can insert the two wires of the linear actuator into one of the motor port pairs on the FeatherWing. You can place either wire into either terminal of any port (M1 in this case) as the motor is bi-directional, and can be reversed in software or in the real world later if you like. This circuit is ready for coding! On the receiving side, our RFM69 Feather M0 and Motor FeatherWing combo has two primary functions: listen for commands transmitted by the chess board system, and then driving the linear actuator's motor either forward or in reverse to open or close the drawer. Here's the code you'll use below. Again, to use it, make a new document in the Arduino IDE, copy and paste the code, save it as chessBoardPuzzleLockRX.ino and then upload it to the Feather M0. You can see in the code that the first thing it does upon power up or reset is to open and close the drawer once. This resets things to the ready position for the puzzle. Then, rather than worry about the particular combinations of pieces on the chess board, it only receives two different commands. A letter 'A' means open the drawer, and a letter 'B' means close it! You could add other behaviors if you like, including driving different motors, lights, sounds, and so on. The communication between the two RFM69 Feather boards is encrypted and sent to specific channels, so there's very little chance of an errant message flying through the airwaves and spoiling the fun! 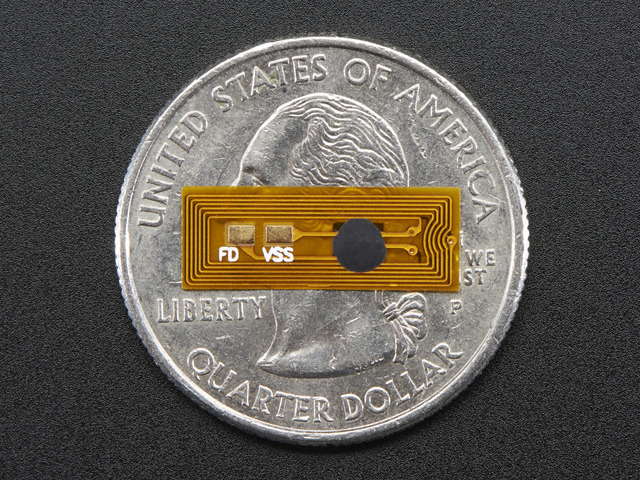 For the puzzle to work, we'll need to hide the micro NFC/RFID tags in the bases of the pieces you'd like to use in your puzzle. The most straightforward way is to use felt-bottomed pieces. You can carefully peel off the felt partway, insert the tag and close it back up. You can use a little bit of super glue to seal the felt back onto the base. Here are three finished pieces, as well as an NFC ring. The ring contains two tags in it, on in the "front" and one in the "back" (relative to a small jewel embedded in it). 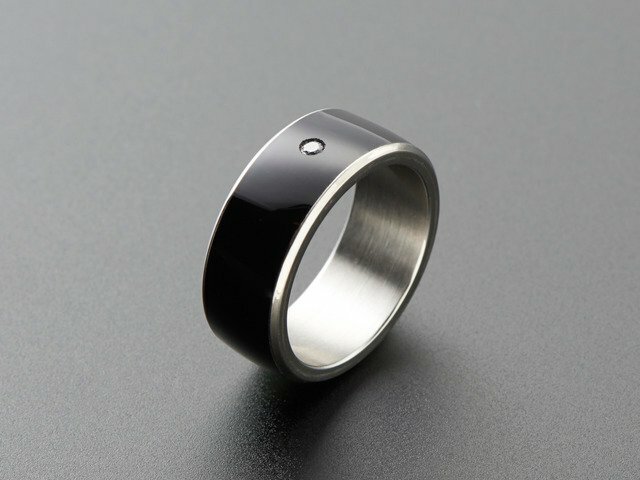 This can be worn by a magician or escape room operator and is used as a secret tag to discreetly reset the drawer when needed. You could also designate other pieces or artifacts for this purpose. Mounting the reader and electronics under the chess board is pretty straightforward. 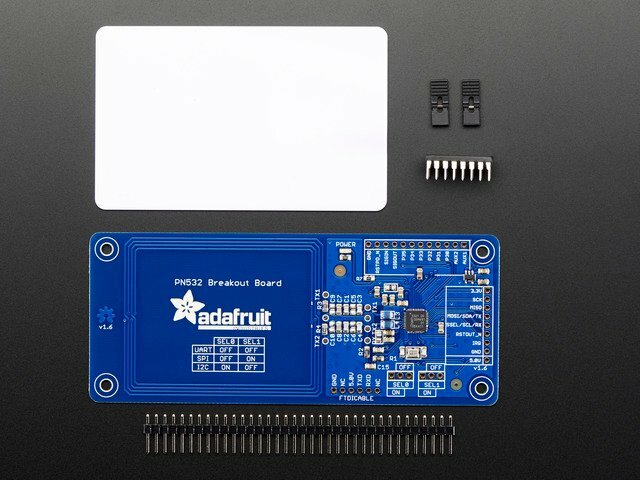 You can use very small screws or even double-sided foam tape to mount the reader flush to the board. Place the reader's antenna coil under the two board spaces you'll use in your puzzle, in this case I'm using g3 and h3. Depending on how you'll be presenting your board for the puzzle, you may need to cover the bottom to avoid spoiling the gag. I used a piece of baltic birch plywood stained on one side. I glued in corner braces to fit and hold the bottom in place. You can place felt protective feet on the corners for a nicer finish and to protect the table beneath. If you haven't got any on hand, you can improvise with some felt, a hole punch, and some glue! Who would suspect anything is out of the ordinary?! It's time to test the whole system! First, make sure the 12V supply for the actuator is plugged in. Power up the two Feathers using their respective on/off switches. You'll see the red lights stay on when powered. The drawer will got through it's boot sequence of opening and closing. Now, you can place the two designated pieces -- here a rook and pawn -- onto the board spaces -- here g3 and h3. After a moment, the drawer will mysteriously open! When you are ready to reset it, you can either power the drawer Feather off and on, or simply use the ring's two tags to close it. You're ready for your next puzzle solver! This guide was first published on Aug 25, 2017. It was last updated on Aug 25, 2017.